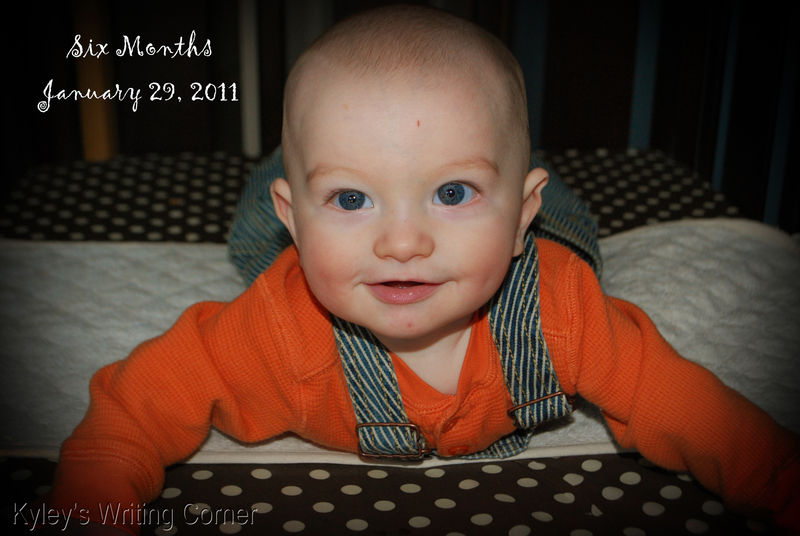 Six months always seemed like such a big age for a baby. Until I had my own. Now I tell myself he’s still a baby, but the fact is he’s not a newborn anymore. He’s just a baby. He can move around, jabber, grab things, and look at something and make the decision that he wants it. My little guy is on his way to becoming a toddler. That may be a little drastic, but some days feel like he is slipping from my grip. For the most part I’m enjoying each new day and new development. But, that all too common cliché is correct – enjoy every minute because it goes too fast. Blarg! I wish it wasn’t true. I wish everyone wasn’t right. Sitting up with the support of pillows around him in case he topples over. Grabbing and reaching for toys. Squealing and jabbering a lot. Pretending to chew things with a dramatic mouth open and close. Still sleeping 10-12 hours at night. Smiling at anyone who talks to him; he knows no stranger. Pulling on my hair and yanking glasses off our faces. Giving giant baby kisses that come in the form of a suction to your chin or cheek. Chewing on fingers – his or anyone who comes in his range. Chewing in teething rings and putting everything into his mouth. He’s so precious! I do not think you are drastic. I still look at Matthew and wonder when he turned from a baby in to a little boy! And, Owen, well, he seems to be growing even faster than that. Every stage seems more fun than the one before yet I find myself longing to go back and take in more of each moment! Just last night I was trying to remember how old Owen was when I met you. And I think he was about 6 months old! Gosh! I look at your pictures, and have seen a good variety of him over the years, and it seemed like a natural, slow progression. But, now I know the truth! When you’re in that position it’s anything but slow! 🙂 I have enjoyed each new stage, but I still let my mind wander too much and get sad sometimes. Giant baby kisses are the best. Who knew that having spit all over your face could actually be sweet!? !